Should I redesign my website? Yes! A clearly defined goal, for example “Enquiries about our new XYZ product”. Have only one goal. Your website will no doubt have lots of other content useful for existing customers, and potential customers interested in other products. However you must use your website to send a consistent message to visitors, and a consistent message can only be used with a consistent goal. What is most important to your business over the next 3-6 months? The technique I’m about to describe will require many changes to your website’s content. If you have a content management system and are relatively web-savvy you will be able to make many of these changes yourself. Alternatively you can hire a web designer or agency to make the changes on your behalf. This is essential – a static website will not improve your website. Doing the same things over and expecting different results is not the way forward. Install Google Analytics or similar reporting system on your website. Make sure you have goals set up in your Analytics profile – your goal will most likely be the submission of an enquiry form. If you don’t have these already then make them your first action points. Great! Now we have the ingredients for a successful website redesign. Give visitors confidence that they are in the right place. Are you a UK business? Do you provide what they’re looking for? Who are you as a business? Who have you worked with? 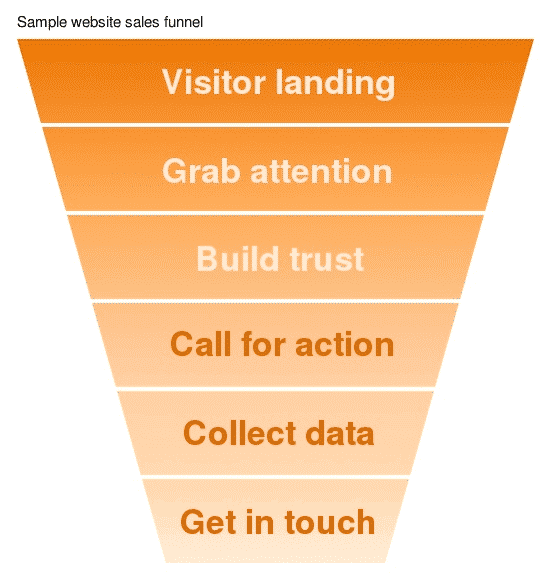 The metaphor of a funnel is used because its wider at the top – you are going to get more visitors landing on your homepage than qualified leads at the bottom. Most businesses will simply look at the first and last slices of the funnel though, which doesn’t build an accurate picture of the funnel/pipeline. Now you can use Google Analytics (or similar) to monitor the success of your funnel. How many visitors does your website achieve per month? How many of those look at more than one page (grabbed attention and building trust)? How many go to your enquiry form (responded to call for action)? How many filled it out? How many did you respond to? These are the numbers that will build an accurate picture of the success of your website. Within 4-8 weeks you will have enough data for analysis. The most important part of this process is identifying areas for improvement. This is the process of redesign and is continual. Your website is never a completed work. It is a living entity which requires constant effort and improvement. Let’s revisit the funnel. This will guide you on what changes to make. Are you getting enough visitors in the first slice? If not you should look at further online promotion techniques. Are your visitors browsing the website, spending time looking around? Otherwise your homepage isn’t grabbing attention or building trust. Are visitors going through to your enquiry form? If not you should revisit your calls to action and sales messages. Are visitors submitting the enquiry form? Otherwise you may be asking too many questions, or the wrong questions. There will always be changes to be made and improvements to implement. Your reporting software should allow you to add comments to graphs – make a note of each change you make so you can revisit it in 4-8 weeks and measure the results. If your changes aren’t working then roll them back, and try changing something else. Keep changes small and focussed so they are easier to measure. Leave changes in place long enough to gather a good amount of data (4 weeks minimum) unless your website has a large amount of traffic.